We got up and had breakfast at Fernlee house, prepared by the house's owner. It included haggis as part of the 'cooked breakfast' which, as haggis is the chieftain of the pudding race, made me quite happy. I chatted with the proprietor for a little while about haggis, apparently my keen appreciation for it is not much shared by most American travellers. However, she allowed that they had a sausage delivery service that provided daily or so their meat-needs for the following day. Another example of the UK just doin' it better than we do. So that's....sausage, cider and pastry, so far. 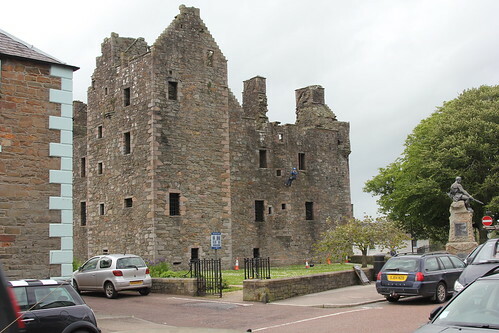 After packing up and heading out of Stranraer; and with pyr8queen driving this time, we headed out to nearby Kennedy Castle. I have a bit of a fascination with birds, and this turned out to be a great place to look at birds. 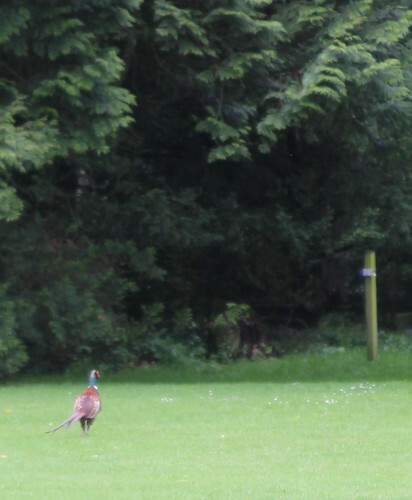 I like "bird looking" as more than "bird watching" because, let's face it, once I've seen the bird, I'm basically done. I'm not going to follow it around and see what it has for elevensies with its neighbors. Kennedy Castle also has a little stand of palm trees, which they are proud of just as Stranraer is. We arrived very early in the morning, and had to sort of moop around for a while until the docent turned up to open the castle grounds. 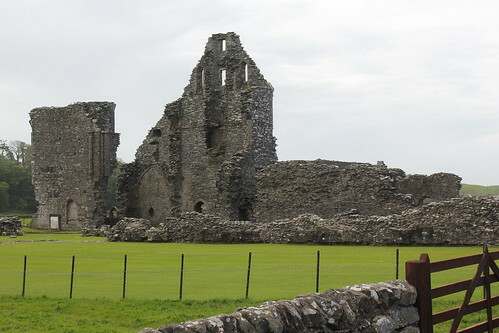 We found, as is the case with nearly all castles, the original military structure is a ruin. 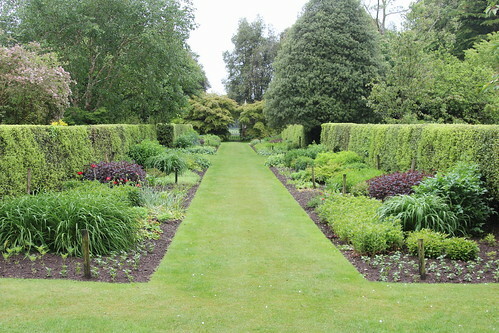 We wandered the gardens and grounds. 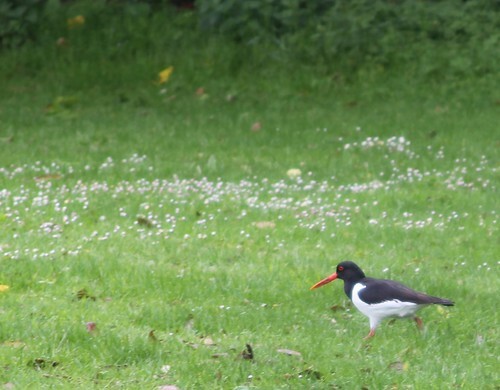 Look at an Oystercatcher, first one I've ever seen. Obviously misnamed, as it didn't catch a single oyster, and frankly I don't think there were ANY oysters in that field. 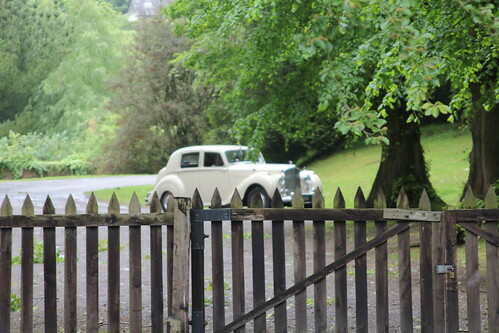 When were done wandering around, mostly because I was incredibly footsore already, we found a couple of old-timey Rolls Royces pulling into the parking lot. Naturally, it was a castle after all. We journeyed on to a place called Glenn Luce Abbey, which was an important stop on one of Scotland's biggest pilgrimage routes. It was in ruins and also not open, so we just kinda...looked at it and then moved on. 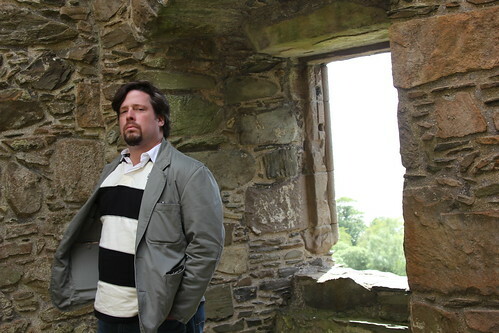 I should really make up some story about having an adventure with like, ghosts of Scottish monks or something. But nah, that didn't happen. It was just pretty to look at. At this point we had no particular agenda for the next day or so. This is shocking, because pyr8queen just doesn't do "no particular agenda." 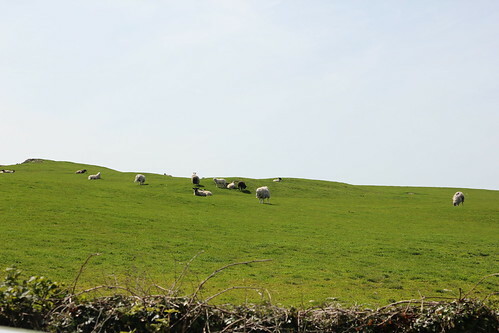 So we looked at some maps, and picked a couple of interesting destinations along the way to what we figured was an interesting place to stay the night, and wandered around, admiring the Scottish scenery, which featured as must not come as much of a surprise, a great deal of sheep. 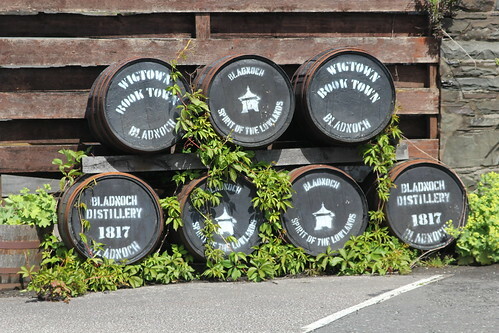 We stopped at a distillery called Bladnoch, and got a tour of the works. It was an interesting story - it had been in operation since 1817, but was at one point purchased as a vacation home by a rich family who never did do anything with it. Eventually they decided to re-open, and found that the Scottish whiskey consortium didn't want them to resume production. Whiskey is taken very seriously in Scotland, as you might imagine, and one does NOT cross the consortium! 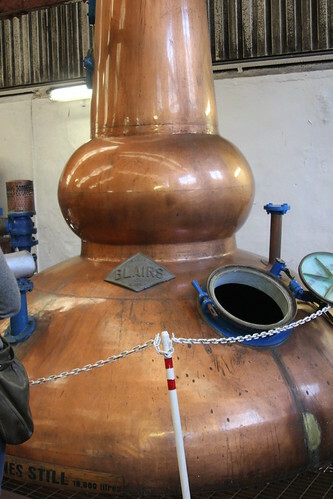 So it remains in operation only for bespoke batches of whiskey, plus a little bit to sell in the gift shop, as well as being a storage facility for the casks of other major distilleries, especially Chivas. 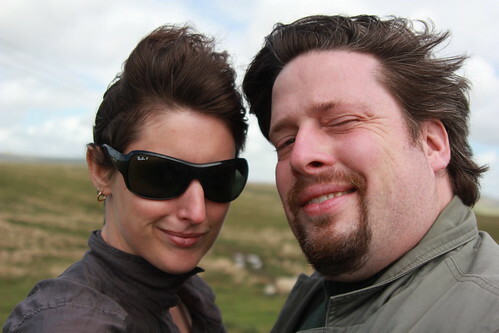 By the time we finished the tour, had a bit of a taste, and picked up a bottle or two take home, including some kinds of whiskey basically impossible to find in the U.S., a terrific windstorm had blown up, which was to continue for several days. 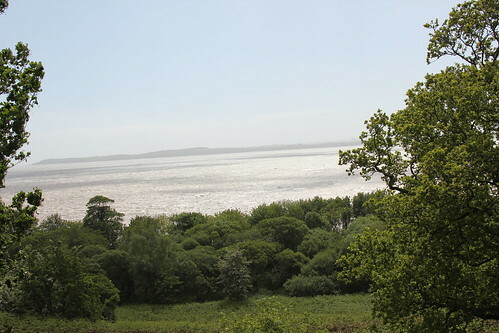 We struck from the somewhat inland area we'd been wandering for the coast, and found ourselves at placed called the Dunbarrow Smokehouse, which was famous for having some of the best smoked salmon (and other meats and fishes) in Scotland. Nearby, we found a placed called Carsluith Castle, another ruined Normal square keep that overlooked the Irish Sea. It had a little lunch shop attached called the Marrbury Smokehouse, where we stopped for what turned out to be a surprisingly delicious treat. They served meats from the smokehouse as well as little pots of tea, and were rightly proud of having provided lunch during the Queen's diamond jubilee. 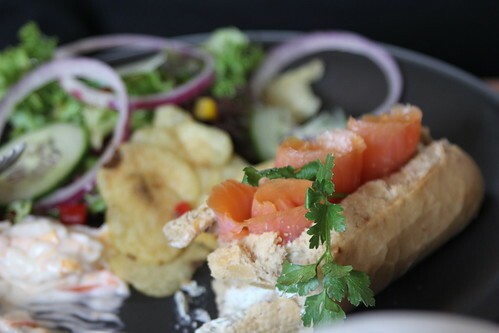 I had a filled baguette with smoked salmon, dill and cream cheese that was superb. But Pascale had crispy smoked duck that I swear, I still dream about. Obviously a very healthy meal. 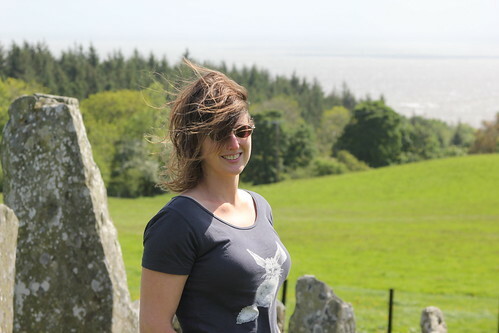 After wandering on we stopped at a circle of standing stones that marked a crypt and/or ancient religious site. 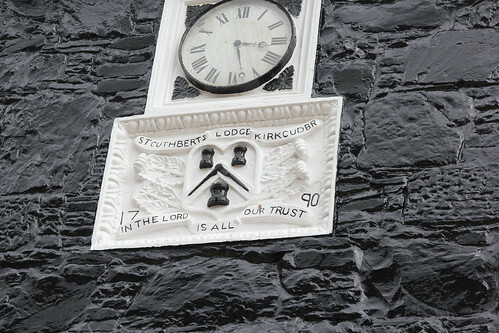 Eventually we found ourselves at a little town called Kirkcudbright. We had picked it as a destination because it was called an "Artist's Colony." We parked on the street and wandered around a bit. I found a Masonic temple right away, and just from looking at its exterior, I could discern certain facts about the rites practiced there, which obviously here I can't relate, but were interesting to me. 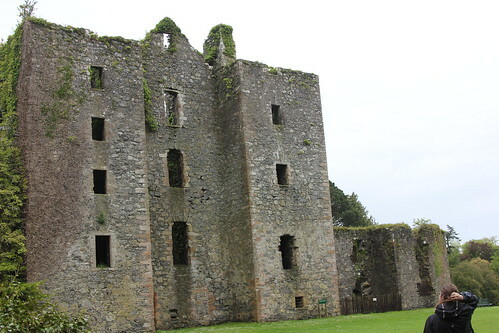 Like many Scottish towns, Kirkcudbright had a ruined fort. 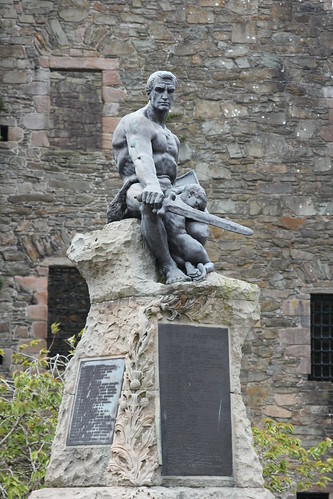 In front of it was a statue commemorating William Wallace. After wandering around, we found no evidence of it being an "artist's colony." I'm not sure what I expected...like some sort of little island, with a bunch of people in painter's smocks looking confused and trying to plant crops? Before departing, I had done a little research to find from where in Scotland my family hails. We are Carsons, a sept of Clan MacPherson, but I never did track down the family castle, mostly because I'd been so busy with stuff for the wedding that I hadn't spent a lot of time on it. 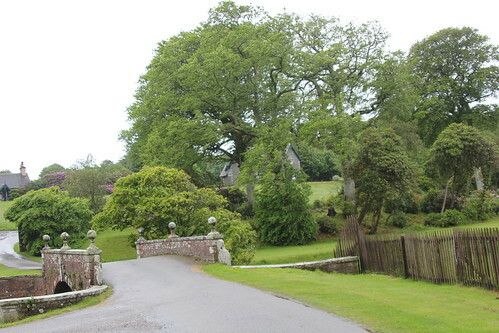 On our return, I found out that Kirkcubright was actually the family home, and it had billed itself as an artist's colony to attract rich patrons, who would be robbed on the roads. Is that true or not? I don't know, but our family has a bit of a dark history, so it wouldn't surprise me. The Carsons are also essentially the same family as the Arkenstones due to some linguistic twist of Viking invaders and Celtic oddity. The Arkenstone is the name of the gem that Bilbo and company are in search of in "The Hobbit." So there. 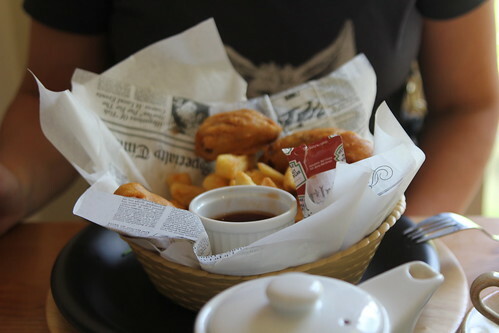 Looking on our map, we found a place that was famed as the "foodie capital of Scotland" called Castle Douglas. We set off for there, thinking that would be a great place to spend the night and get some dinner. As we journeyed across the lowland vales to get to Castle Douglas, the windstorm whipped up so fierce it was nearly blowing us off the road. We stopped to take a picture, for some reason. 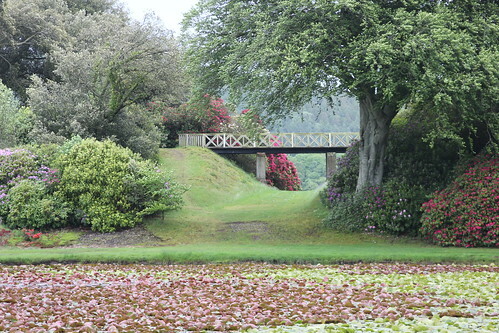 When we arrived in Castle Douglas, we couldn't find a room at three different hotels. We finally got a room in the Crown Hotel, which also had a pub and restaurant, sort of Fawlty Towers style, in the ground floor. Also Fawlty Towers-style, the hotel manager was also the cook, bellhop and barman, though despite my request, he didn't wear a different hat while doing each role. We had dinner in the pub, and I had a Scotch Pie and sticky toffee pudding. In my notes, I have underlined Sticky Toffee Pudding very emphatically, and on the reverse page, I wrote a note to myself across the entire page in all caps: "LEARN TO MAKE STICKY TOFFEE PUDDING." Seeing that note, I realized I'd forgotten to do so, and I made some Friday evening that was well received both then and on Mother's Day. After dinner we asked the barman/cook/manager/bellhop/waiter why Castle Douglas was called "the foodie capital of Scotland" and he explained that once a year they had a big festival where everyone ate outdoors. I said that sounded kind of like a big picnic, really, and he allowed that it was mostly just a marketing trick to get tourists in, and otherwise the town was pretty unremarkable. Just like, he explained, the nearby artist's colony of Kirkcudbsbright, which really had no particular connection to the arts. HA! Mystery solved on that one, too. Oh man, sticky toffee pudding... I should also learn to make that. Nom.